If there’s any label that stands to the cult of fashion it’s Comme des Garçons. Designer Rei Kawakubo disrupted the fashion industry with her uniquely uncompromising ‘anti-fashion’ stance that electrified Paris Fashion Week in the 1980s. With a main womenswear line and twelve diffusion lines, the brand encompasses many different sub-lines with different purposes. 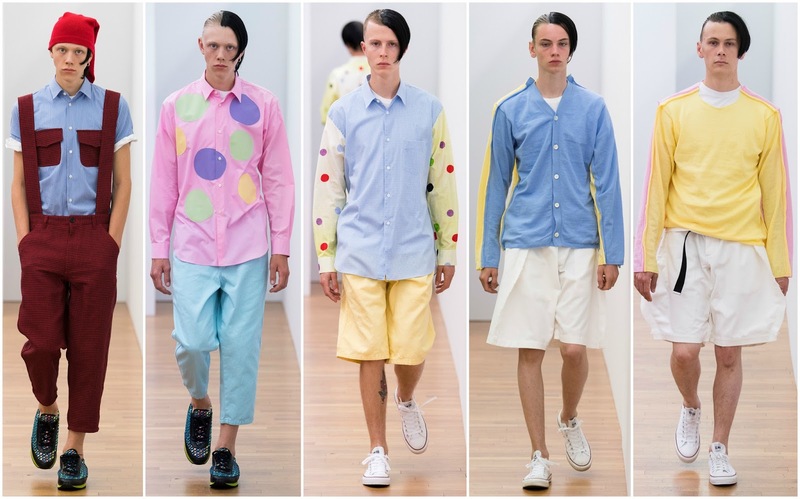 One of the most notable ones is Comme des Garçon Shirt, a menswear label showing biannually during Paris Fashion Week. It is generally presented the morning after the mainline menswear and it starts two minutes early—if you want to see it, you have to be willing to be punctual. And people are! The fashion press turn out in their droves to see the collections which, simply, are replete with various shirting options. Comme des Garçons Shirt isn’t groundbreaking or thoroughly interesting as the mainlines. It isn’t meant to be. The t-shirts, shirts, sweaters and more are retailed at lower price points and sell like hotcakes. Presumably, they provide for the bulk of profit. A Shirt tee, which is branded with a love heart and eyes, would set one back between £60 and £100 which rivals the high street nowadays. The distinctive love heart is the defining characteristic of the clothing. Incorporating contemporary art is a discernibly easy route for those brands who wish to push product upon the customer at any opportunity, starkly contrasting the way that high fashion reverentially references artists. Loosely riffing on Heilmann’s oeuvre successfully creates colourful and imaginative basics. It doesn’t reinvent the wheel, simply it joins in on its rotation. Off the back of a successful exhibition at the Metropolitan Museum of Art in New York, which documented the Kawakubo’s singular vision one might be quick to say it renewed interest in the virtuoso. However, she’s always been intensely watched by the industry’s press and buyer contingent. If anything, it has instigated widespread interest, in every aspect of the CDG world, from the conceptual, anti-fashion, amorphous womenswear mainline down to stripy t-shirts with a love heart motif that are mass-produced and sold in Dover Street Market and other department stores, brick-and-mortar and online.